Någon har redan tryckt på ”reset” | Vad händer i Mellanöstern idag? For several years there has been talk of a financial and economic “re set” coming, this is no longer speculation as the reset has already begun! The Swiss have suppressed the price of their currency, the franc, since late 2011. They pegged the franc versus the euro with a “floor” versus the euro at 1.20. After confirming this floor publicly on Monday, they abandoned it Thursday only to see the euro depreciate through the par level. What you saw on Thursday and Friday was the work of Mother Nature as the Swiss decided they would be better served by no longer battling her. Think about this point very seriously, many investors (and firms) went to bed Wednesday evening with no stress at all on their portfolios (or their business), in just five minutes Thursday morning they were insolvent. Just FIVE MINUTES! We are only talking about “investments” here, how many other real businesses in the import and export area are now broke? Broke because they hold euros but need francs or they export from Switzerland or import to Europe and now their business model makes no sense? How is this even possible in just five minutes time? As an additional note, we have one last question to ponder which may or may not be connected. Koos Jansen put forth a “mystery guest’s” theory that the Swiss went short gold in Sept. 2011 which marked the top in gold. He asks in the following link, “did Switzerland just cover their short“? Prior to joining Miles Franklin in 2012, Bill Holter Worked as a retail stockbroker for 23 years, including 12 as a branch manager at A.G. Edwards. Later, he left Wall Street to avoid potential liabilities related to management of paper assets. In 2006 he retired and moved to Costa Rica where he lived until 2011 when he moved back to the United States. Bill was a well-known contributor to the Gold Anti-Trust Action Committee (GATA) commentaries from 2007-2012. Safe Haven Test: Gold vs Swiss franc. 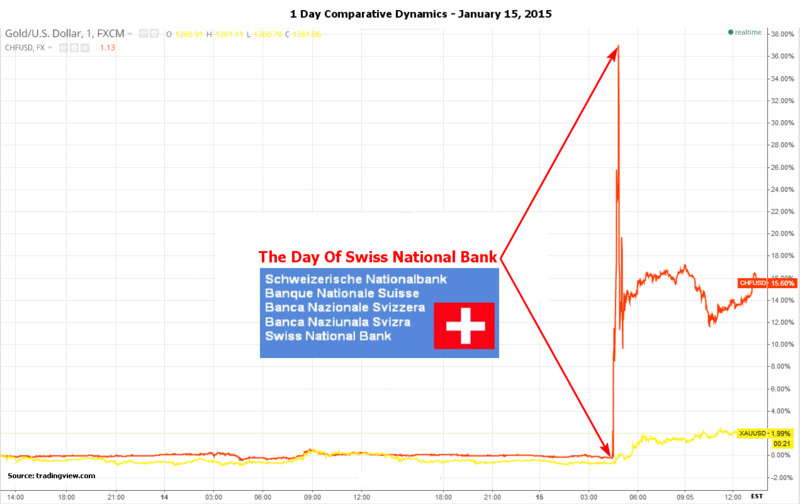 SNB edition. Today is surely Swiss National Bank’s day after it abandoned the cap for EUR/CHF cross which was introduced in September 2011. Swiss franc surged for a record against everything that can be traded. What are the first associations when we are thinking about Switzerland? Yes, first is gold, then luxury watches and of course chocolate. This country has had the gold of the world stored in its banking vaults and a safe currency, but now the Central Bank is nervous because of the currency’s excessive appreciation. So today’s shocking Swiss franc move inspired me to compare both instruments boasting a safe status. Below is today’s comparative chart of gold and CHF against USD. I will put an inverse cross of CHF against USD in all charts for easy perception – both gold and franc will be displayed as the base currency and the dollar will be the quoted currency (usually it is traded as USD/CHF – dollar is base currency, franc is the quoted currency). Just after the SNB announcement, the market lost its liquidity as everyone was shocked by such an unforeseen move (recently SNB spokesman declared that currency stability is a key element of their policy) and the franc flew to 37% gain level at once. Gold also started to elevate, but the move was comparatively moderate. At the moment (2 pm EST), the 1 day growth is almost 2%. The franc stopped soaring and calmed down to almost a 16% gain. Just to show the difference, when SNB introduced its peg in 2011, the Franc devalued. It showed a relatively modest 9% immediately after the announcement. So this time it was a real shock for the market. 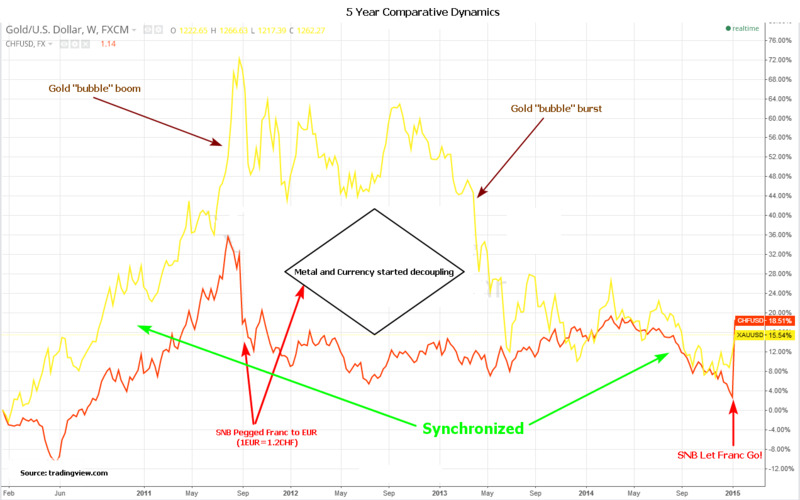 To understand the comparative power of gold against the franc, I will be adding more time frame-charts with longer periods. Next is the 1 year relative dynamics of the two instruments. In the meantime, both gold and the franc on a 1-day and 1-year graph are moving in the same direction with more volatility in gold. 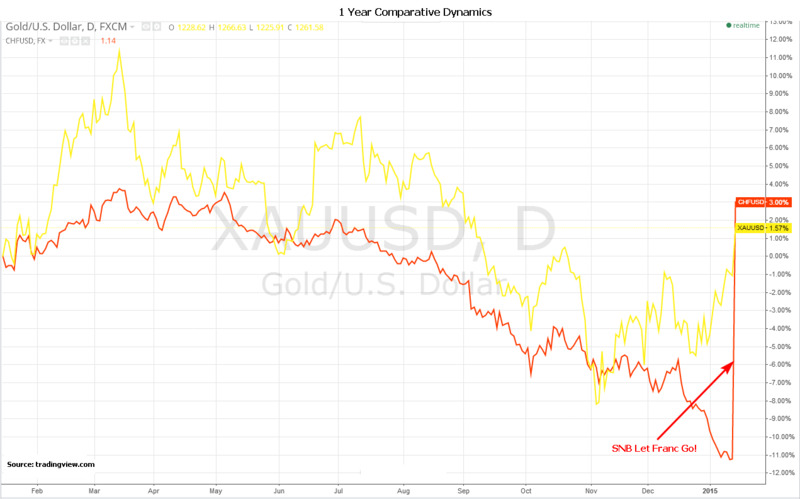 Only at the end of 2014, gold started to diverge rising against dollar while the franc continued its fall. Today, SNB returned power to the franc. 1 year summary – franc gaining 3%, rocketing it from -11%. Gold is making 1.57% which also reversed from negative territory. Here comes the more interesting time frame – 5 year. 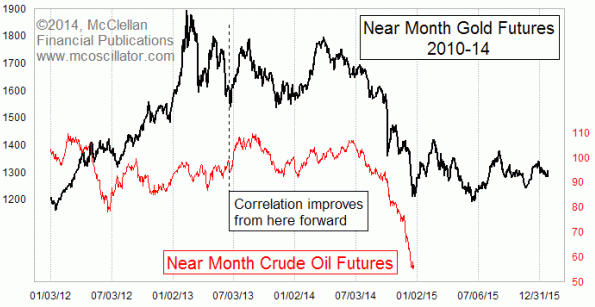 Here we can see why gold and CHF are usually put together when one mentions safety. They move head to head (highlighted with green arrows) for years. But I want you to focus on another interesting behavior. I highlighted with red arrows and the black rhombus the time when SNB launched its peg for EUR/CHF (it immediately affected the USD/CHF). Right after that, both instruments started to diverge: gold continued in an uptrend and CHF, on contrary, lost the 1 year gain. This artificial intervention in the market was clearly depicted by the price on the chart. And this is not the last interesting thing. If we will look closely to the gold trend, the natural move would be stalled at $1500-1700 level. The market would then fall back to new normal $1000-1200 level. Instead, the trend became steeper and the price soared beyond $1900 and then fell back to a normal curve at $1500-1700. Gold, more than franc, tends to inflate “bubbles” which burst from time to time. And right after such burst, these two safe havens met on the graph again. 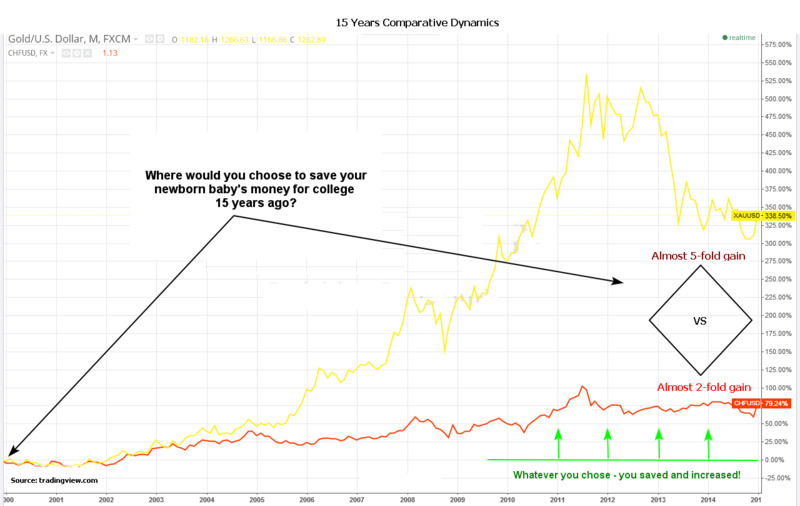 But to answer our title question, 5 years is not enough as both showed close results just below a 20% gain. Below is this century’s chart of dynamics for past 15 years (from December 1999). I bet now it’s clear which one is saving your money the most. Gold is the winner. If you were wise enough, or not so greedy to cover longs in 2011-2012, you could have gained more than 6-fold on your investment. Even these days you would still be making decent 338% gain. Franc just made 80%, a laughable return if compared to gold. From 2002, both managed to be in green all the way up to date and therefore this couple confirmed its safety status. Best wishes and lucky trades!